We often hear, it takes a Village… LET’s BUILD IT. As a John Maxwell Team Certified Coach, Trainer and Speaker and the founder of LET’s Build IT a leadership development, consultation and training company, I am committed to inspiring, equipping, and aiding your personal and professional growth through study and practical application of a variety of proven leadership development methods. Trained and mentored by John Maxwell and his world-class faculty, I am equipped to help you and your team improve your productivity and move in the direction of your goals. My leadership beginnings started as a supervisor for United Parcel Service followed by a 20-year career as a police officer where I learned the value of servant leadership and developing relationships with the people in the community I served. After the tragedy in Sandy Hook, Connecticut, I felt compelled to get involved in a variety of children’s behavioral health and Juvenile Justice system change efforts. “Young people should not have to be arrested before they get the mental health services they need." 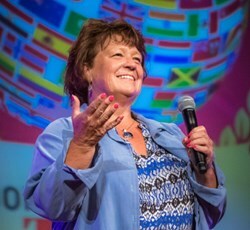 As a speaker, trainer, mentor and coach, I have successfully helped families, youth, agencies and organizations build sustainable change-making partnerships by helping people develop their ability to assess complex situations, recognize opportunities, and create solid workable action plans to achieve their desired goals. I am equipped with the tools, resources and experience to help transform you and your team. You have my commitment to deliver high energy thought provoking content filled with passion and entertaining stories. I hold Master degrees in Social Work and Women’s Studies and undergraduate degrees in Sociology, Psychology and Criminal Justice.